Most readers of this blog are probably already concerned about climate change, and possibly active in reducing it. This sometimes results in hostility to the people judged to be deniers or those who seem spiteful about adding to it. Lots of reasons are blamed for their negative responses: inaccurate and inadequate media coverage, investments in fossil fuel and weapons industries, mistaking it as a political issue, just plain greed. Many efforts have been made to overcome these resistances directly: for example, by providing better information. These efforts don’t always work, at least in the United States. I believe we must at least consider another source of the problem: the need to update “brain technology” to deal with current problems of climate (as well as violence and poverty). While some brains have evolved to motivate people to action, others seem stuck in past technology. Einstein warned: No problem can be solved from the same consciousness that created it. Fortunately the brain is able to develop new connections throughout life. Every day the brain computes ways to respond to new learning, new experiences, new awareness — new questions! The more of us who “download” better awareness, the stronger the field becomes, and that makes it easier for others to evolve. New awareness grows from old. Let’s consider the consciousness humans already have evolved. course, but additional “brain software” is now required for survival. millennia, but no longer is. impossible to reverse. 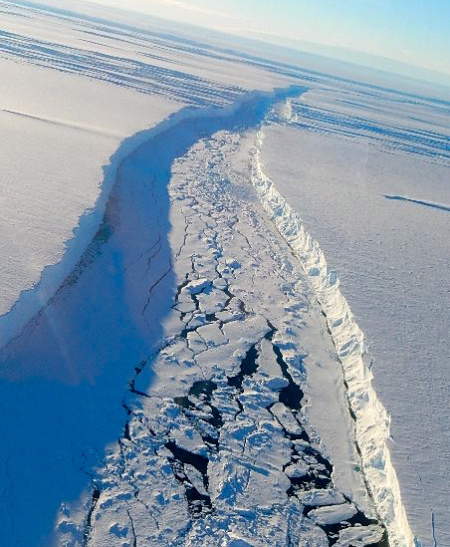 Six glaciers have reached irreversible collapse. Sheet – and more rapidly than predicted. Further, the damage is self-perpetuating and will accelerate over time. It cannot be stopped. and resulting ocean rise. But this, too, requires vision for the future. everything is made of separate atoms. Competition and hierarchies resulted. God was relegated to the sky, separate from Earth. Recognizing differences was necessary and still needed. But our time calls for “brain-ware” that also recognizes that those differences exist within intercommunion and interdependence. Those atoms belong to wholes. The Divine Mystery is present everywhere, living and acting within all creation. like poverty, trafficking, refugees. And they can think of it as separate from themselves, something “out there.” People choose their issue and miss the interconnectedness of all issues within one whole. contribute consciously to our evolution story for good or ill. It sees creation as a sacred interconnected process in which “nothing is itself without everything else.” (Thomas Berry). sciences, but mystics and others have lived it for centuries. Because of this wholeness, we cannot do one thing. The butterfly effect (wings flapping somewhere changing weather somewhere else) is a well-known example of that, but even babies learn it from mobiles. Touch any one item, and all are influenced. jobs . . . .
Civil War, which ultimately became ISIS. War, but it definitely contributed. This is true also in places like Nigeria. how climate change increases the risk and level of economic, political, and ecological conflicts. Dislocated and impoverished children are targets for trafficking as well as death by starvation and dehydration. Connections are everywhere to those who can recognize them. Chardin) Let us pray to always see the sacred in all things. Let us pray when we are tempted to judge others and become impatient and frustrated. Let us pray that we, too, keep evolving! If this rings true for you, or if you have experience with it that you can share, please respond in Comments. Your presentation of “a deep time journey” as an ongoing evolution ought to inspire humans to make the connections presented by global warming that you,Terri,have explained. Conflicts in the Middle East, African nations and the USA to mention a few are rooted in drought, scarcity of work, starvation and drastic efforts to protect ones own rather than to share the resources available to humans to use creative means to strive to face the challenges. Many thanks, Mary Frances. Yes, it’s all connected, and that’s so new for many! It can be a real “eureka!” moment when one sees the connections. Thanks so much, Ann-Joyce, and loving hugs! Thanks for your comment, Sandra, and for all you do to support efforts to see the sacred in all things! Terri, finally got to read. Nancy Erts, OP,,shared at this week’s ROAR meeting. Great article. Thank you!